LOVELAND, Colorado – To its list of ideas for changing the way horse businesses use their land, the working group in charge of developing new rules has added a grace period for existing horse businesses to comply, and the term “equestrian center” to its vocabulary. “If you’re living next to dust and manure, you’re gonna complain,” said Linda Hoffman, director of the County’s Rural Land Use Center. Hoffman outlined top issues surrounding horse property use, existing land use code, and the group’s new ideas at the first of two public meetings Tuesday night. The grace period, called a “transition program”, would probably involve a fee and a deadline for facilities that have, for whatever reason, never been approved by the county, but would like to be recognized now, according to Hoffman. The working group coined the term “equestrian center” to combine horse boarding and teaching of riding lessons or other horse activities. In existing land use code, the terms “riding academy” and “boarding stable” bring confusion to an already murky set of rules, and that is “one of the things we think needs to be cleaned up,” said Hoffman. Timing is everything. That was especially true the day Juan Rael saw the horse in the sale yard. Blood bay, tall and powerful, the gelding had the look of an eagle, the body of an athlete, and high-stepped like a parade horse. Juan Rael loved horses. Juan Rael hated horses. They drove a practical man like him crazy sometimes with their unpredictable and demanding ways. People remembered long after Juan died that the day he switched from ranching with horses to ranching with tractors, Juan also quit swearing. Juan went out window shopping for ranch stock that day in the 1930’s. He took one look at the bay and knew the animal carried good blood. Juan timed his bidding perfectly and went home with the horse they later called “El Bayo”. El Bayo soon made it clear that he would not work for everyone. “He was highly-spirited and he loved to prance,” said Juan’s youngest son, Nicholas Rael, who lived through what he calls “a strange love story”. Nicholas grew up working for his father on Rancho Uraca (Magpie Ranch) in a valley at the foot of Colorado’s Sangre de Cristo Mountains. One man fell in love with El Bayo, and that was Luciano Jaramillo, Juan’s dashing, part Ute Indian brother-in-law and partner. Apparently the feeling was mutual. Larimer County, Colorado –- The working group appointed by county commissioners to spearhead new rules for horse stables has ideas and goals to share with the public at two upcoming meetings. Monday, June 22, 2009, 6 p.m. to 9 p.m., The Ranch, Thomas M. McKee Building, Loveland, Crossroads Blvd. and I-25. Presentation at 6 pm., open house to follow. Thursday, June 25, 2009, 6 p.m. to 9 p.m., Larimer County Courthouse Offices Building, Hearing Room, 1st Floor, 200 W. Oak Street, Fort Collins. Presentation at 6 pm., open house to follow. In 2006 a move to tighten livestock restrictions failed in a vote before the commissioners. As the result of about 25 complaints against facilities boarding horses, the commissioners voted late in 2008 to narrow the scope of proposed land use changes to horse businesses. On Saturday, June 20, the working group plans to take a bus tour of horse stables for a first-hand view of stable issues. County commissioners are set to vote on the rule changes in December. For information go to: http://www.larimer.org/horses/ or contact Rural Land Use Center director Linda Hoffmann at (970) 498-7681, lhoffmann@larimer.org for further information. For MyHoofprints previous coverage on this story, go to: Horse Property Issues. Our hearts go out to the family of Eloise "Ellie" Peek, who died Sunday after a horse kicked her in the head at her grandparents’ farm in Hainford, Norfolk, England. Ellie went out to check her pony, Flynn, before an upcoming horse show, and was kicked by another horse, according to the Morpeth Herald, Ellie had been riding since age four, and according to the Mirror News she attended many jumping competitions. We will probably never know what actually happened during the accident, but this proves a grim reminder of the importance of safety zones when working around horses. Colorado 4-H’ers are taught never to stand directly in front of or behind a horse, but to always work from the side. Believe it or not, it is safest to stand close to a horse’s hindquarters, as opposed to standing several feet away. Always touching a horse and talking to it as you move around its hindquarters lets the horse know exactly where you are. If you stand too far from the horse, you run the risk of being at the point of maximum impact should the horse decide to kick. Another safety must-have is the video, Every Time, Every Ride, which talks about the importance of helmets. Rest in peace, Ellie. Our gelding, Billy, went down on his knees about 10 years ago just before my son’s Hunt Seat class at the Colorado state fair 4-H horse show in Pueblo. This handsome red gelding had seemed fine all morning, but the temperature spiked 30 degrees in two hours, taking us from the 60’s to the 90’s. We did not think anything of the uncooperative weather until, on the way to the in-gate with his boy, Billy went to his knees, and then to his side. If we had not pulled Billy up by the reins, he would have crushed the saddle. Billy had colic, the Number 1 killer of horses. The many kinds of colic all involve stomach pain. Two of the many causes include a sudden change in the weather and heat distress. Like dehydrated people who experience headaches and muscle cramps, heat stresses horses and they need constant hydration to help cope. Billy suffered a handful of other colics over several years until we figured out that he drinks little water. Today, Billy gets daily electrolytes, and an extra dose for any summer horse show. The electrolytes did the trick. Since then, Billy has been as healthy as … a horse! We prefer Vetline's electrolytes or for convenience, a monthly SmartPak shipment. 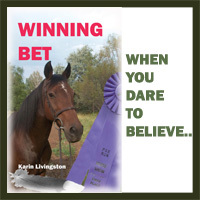 Before the great Founder Chronicles (last eight stories), Bonnie and I had won a $100 Grand in Reining. Hard to believe, but true. And to think I never even reported it to the Internal Revenue Service! No, this is not a tax-evasion confession. They gave us a Nestle $100 Grand chocolate-caramel-crunchy-stuff bar and a blue ribbon in Reining at the Rockie Mountain Saddle Club. It was the best candy bar I ever ate, and last time I checked, the government had yet to tax candy bar winnings. Last weekend, Kalvin, aka: Kalvin the Krazed, won a gold medal in jumping! OK, OK, it was a first place in the Pile -of-Poles class at the Northern Colorado Riding Club, and the medal was not solid gold, and it had a picture of a horse instead of Olympic rings. But I will always remember these horse show awards as being very cute and thoughtful. This is for all you organizers of all the open horse shows and horse show clubs in this country. Stop right now and give yourselves a pat on the back. Because of you, “horses” and “fun” remain synonymous. The winter following Bonnie’s laminitis attack, nature hit us with three-plus feet of snow a few days before Christmas. The horses would have been “trapped” in their stalls without Bonnie because humans could not punch through the deep footing. Our tractor was otherwise engaged just trying to dig itself out of the hay barn and break us out of our long driveway to the street. We used short, easy-to-mount Bonnie to individually pony 14 other horses to their pens. Bonnie plowed a path through the snow with her front feet, and threatened the other horses with evil, pinned ears and bared teeth if they did not behave. We considered this a good sign. These days, Bonnie still eats only irrigated grass hay and her Triple Crown Lite diet “grain” mixed with Quiessence. When riding, we always give Bonnie, now age 25, long warm-ups and long cool-downs. She wears normal shoes. Bonnie loves to jump obstacles up to about two feet high and she and Buck the Dog remain pals. Immediate veterinary intervention, good nursing, proper shoeing, proactive nutrition, and advice from good friends were the medicine Bonnie needed. We consider our plucky mare cured. By late summer, Bonnie would still "eggshell" walk the first five to 10 steps out of her sand stall on to the pea gravel and packed dirt of the barn floor. As Bonnie warmed up, her movement would improve and by the time she hit the deeply plowed footing of Pooh Lane, Bonnie looked much better, leaping on the end of the lead line, and taking trotting steps of her own. Bonnie and those of us taking care of her were thoroughly sick of the stall captivity and hand-walking routine. We wanted her to go back in daily turnout with her horse friends where she belonged, but every time we tried putting Bonnie on harder ground, she limped terribly and drooped, the picture of depression. I had read about a number of exotic shoeing solutions, some that even used dental glue as a sole support on top of a pad, but I had seen bad things happen to hoof soles that did not get enough air. I wanted something durable, affordable and healthy. (I have since learned that there are safe adhesives on the market. If I had to go through this again, I might try the EponaShoe. Our farrier, Tom Presgrove, suggested putting shoes backwards on Bonnie’s front feet, so that the “toe” of the shoe would actually support her heel and to a certain extent, Bonnie’s sole. I couldn’t believe it when, five minutes after the backwards shoes went on, Bonnie was able to jog on hard ground! Bonnie seemed to enjoy being the stable pet, but as the summer began to heat up, so did her digital pulse. Taken behind the pastern, the digital pulse is an indicator of inflammation in the foot or leg. Every time Bonnie’s pulse increased, her pain got worse, and she would resist exercise. Plus, her feet, while growing, had become dry in the sand bedding of her stall. A dry hoof is a rigid, low-circulation hoof; not good, especially for the foundered horse. The 10-minute walks were not enough to keep this athletic horse happy, and stall detention was turning Bonnie into a crabby attack dog toward her neighbor, my kind, loving gelding. At one point, Bonnie kicked out a stall wall between the two horses. In hindsight, we probably should have gone shopping for stall toys . Sympathetically imagining what would make our own hot sore, feet feel good, we tried soaking Bonnie’s front feet in a five-gallon tub of chilled water half-filled with sand for support, along with 1/2 to 2/3 cups of Absorbine veterinary Liniment tossed in for a soothing effect. He soak worked like a miracle, providing yet another alternative to bute. After her soaks, Bonnie would dutifully and happily take her in-hand walks down the plowed Pooh Lane. Now we just needed to figure out a way to get Bonnie back on regular footing.